As far as triathlons to tick off a ‘so called’ bucket list this was one of them. Sitting down with my fellow Racepace athletes at the end of 2017 we muted the idea of entering this race and a month later we had booked it, the long course too (no point in going and just doing the middle). So, we all had it in our diary and we were making a week-long trip to the French Alps………I personally could not wait. On arriving in the Alps the weather was blue skies and not a cloud to be seen and this lasted for the whole week. 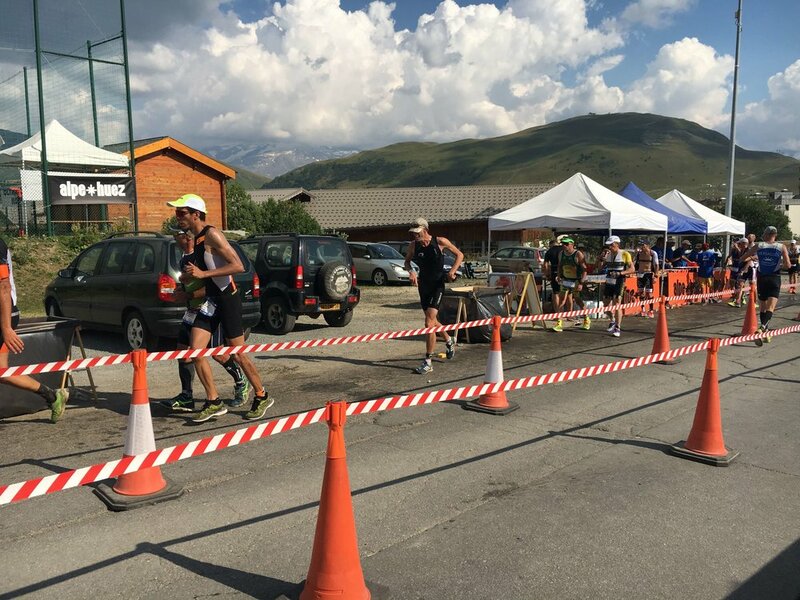 On some days temperatures were touching 35 degrees – race day was going to be about managing the body with hydration and food. I was raring to go for race day and having done plenty of scoping out of the course in the days prior I was ready for the challenge and confident I would have a good race. There were over a 1000 people on the swim start line which was a real picture as I looked back from the front. We all looked like lemmings, blue and pink heads bobbing around waiting for the air horn at 9.30am. The horn goes, and we are off (washing machine springs to mind), elbows and feet everywhere – survival of the fittest, claim your space and don’t give it up. It was a 2-lap swim of 2.2km and things settled down after the first lap, so I could get in my rhythm more. I was out and up the ramp in 44mins which when looking at the results was a few minutes slower that I was looking for. Anyway, into T1 to pick up my TT bike and off over the mount line and straight up a cheeky hill which got the heart rate going. The bike was 118km with 3 mountain climbs (some other sneaky ones in there too) culminating in the last climb of the famous Alpe d’Huez bike leg of the Tour de France - 21 switch backs to get up a bloody big mountain. In total there was over 4000m of climbing. This bike leg was all about tapping out a nice rhythm up the hills and maximising any flats and down hills with the TT bike, as most people were using road bikes. I always had 3 bottles on my bike with a mixture of drink types and as I was approaching various feed/drink stations made sure I was ready to swap them over and re-stock, plus also gauge what food I had left and whether to take any from the stations. 5hrs and 40mins later I got to T2 at the top of Alpe d’Huez. I have never wanted to get off a bike so much, my backside was killing and my arms and calves from all the climbing were crying out for a break. The legs unfortunately did not get the rest they wanted as they had to carry me for another 20km on the 3-lap run. Half way through the run I was wishing I was back on the bike, it really was a case of putting one foot in front of the other. Again. I took every opportunity to take on fluid and throw plenty of water over the body to cool me down, it was very hot. The cap I bought the day before was a massive help in keeping the sun off. As I ran down the blue carpet towards the finish line I did not even have the energy to look at the time, I just collapsed and laid out looking up at the sky, very happy that it was all over and I had finished. A run time of 2hrs 4 gave me a total time of 8hrs 34mins, a proper mission and my longest triathlon by over 5.5hrs. I spent a good amount of time in the recovery area and made good use of the ice baths and free food. On reflection this is a race in an awesome location, brilliantly organised, extremely tough, very rewarding, very challenging and not to be underestimated or taken lightly! 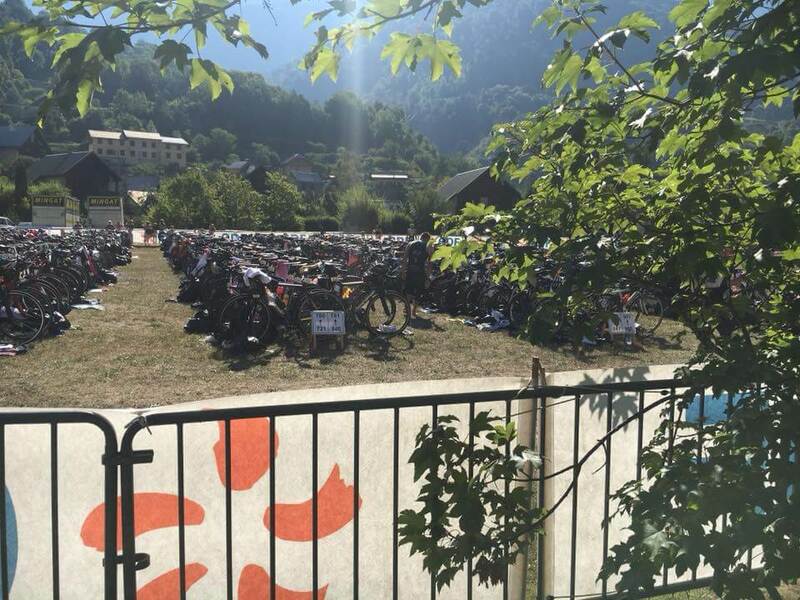 It’s 6:30am and the day after the Alpe d’Huez long triathlon and I’m currently led on a settee in the French apartment we had rented for the week contemplating yesterday's race. One thing is for sure it was the toughest race I had done. The lead up to the race had gone well, 2.5 weeks ago I had completed Ironman UK and felt that I had recovered. Arriving in France on the Saturday before gave me plenty of time to recce the run course, drive the bike course and ride the last climb up Alpe d’Huez and I was good to go. The race had a split transition format so on race morning I met up with fellow Racepace athletes Beau and Robert and got to T2 in Alpe d’Huez at 7am and made sure we knew where bike in and run out would be and then headed down to Lac de Verney with our support crew for the day, my husband Pete and Racepace coach Rodger. The swim start is one mass wave so with over 1000 athletes I was expecting a bit of a fist fight. I got to the front of the start and waited for the hooter which went off at exactly 9:30am. The swim was 2.2km split over two laps and to be honest the fist fight never really materialised. At the first turn buoy there was a little bit but nowhere near as much as I expected. With so many other competitors it was relatively easy to find feet and exiting the water I heard I was 10th female. Having driven the course and done some research, I was looking forward to getting out on the bike. With over 9000feet of climbing over the 120km the route was not to be underestimated. I had made the decision to ride the course on my TT bike as I felt there was more of an advantage to be had on the fast sections and being a competent rider knew I could ride it up the hills. The first climb came after about 25km of fast riding and that’s when I realised I just didn’t have my climbing legs today. From that moment on I just had to keep telling myself to keep moving forward, keep on top of my fuelling and above all keep 'smiling'. Yes it wasn’t going to be the performance I knew I could deliver but I wasn’t going to let that stop me from giving my absolute best. There were definitely moments on the bike that I could have happily stopped but that was a choice I didn’t want to take. Getting to the bottom of the Alpe d’Huez climb I knew there was just 13km and 21 iconic hairpin bends between me and the start of the run course. 100 minutes later I made it to T2 and it was time to find out whether my legs had anything left for the final 20km run. The run course was three undulating laps with a small portion of each lap on trail. Having managed myself as well as I possibly could I dismounted the bike mentally ready to dig in and get through the next 20k of running. There were several aid stations per lap and I’d decided to just take water from these to either drink or throw over my head and use gels as my fuel. Throughout the day the temperature had been rising and the run course was very exposed so on my second lap I grabbed a small bottle of water from one of the aid stations so I was able to drink and douse myself when I wanted and could refill this a couple of times per lap. I felt in control during the run and saw many people really struggling with the heat and it’s associated problems. I just kept going, it probably wasn’t too pretty to watch but I made it and after just over 8 hours 52mins I crossed the finish line completely exhausted and happier than ever that I had finished a race. In terms of character building it's these types of races, i.e. the ones where you aren't feeling your best, where you have the opportunity to grow the most. I had been really excited about this race since we (Rodge, some team mates and myself) had decided to target it back in October 2017, and as one of my primary focuses for 2018 I had done a decent amount of prep for it. After 30hrs of travelling we arrived at our appartment for the week in Bourg d'Oisans, at the foot of the Alpe d'Huez climb, with four full days before the race and used the time to learn as much as possible about the course and to do any final prep. All events have their own unique quirks but there was plenty to distinguish this from others: a swim in a hydroelectric dam facility where swimming is forbidden any time other than the race; split transitions around 20km apart (and 1000m elevation), a 120km bike course taking in two significant alpine mountain passes (at least 12km & over 1300m) before tackling the infamous Alpe d'Huez climb with its 21 hairpins; 35degree heat; and a 20km run at over 1800m altitude! An early start on race morning, coffee, porridge and a banana to fuel myself up and we were on our first ascent of Alpe d'Huez (thankfully in the car this time) to drop our trainers and run gear off in T2. The second transition area was on a 3G football pitch and Sarah, Bob and myself were all next to each other with consecutive numbers. 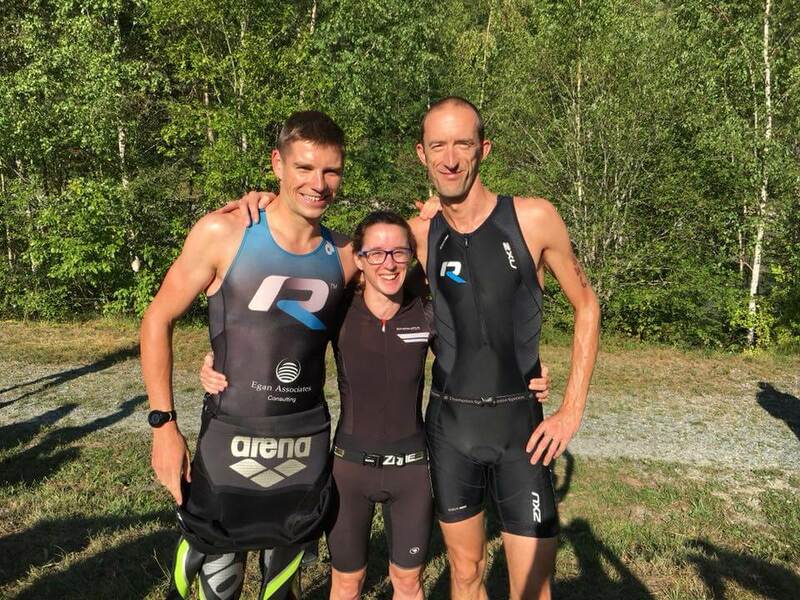 With T2 set up we then had another 30 minute drive down to the swim/T1 area at the EDF Lac du Verney. 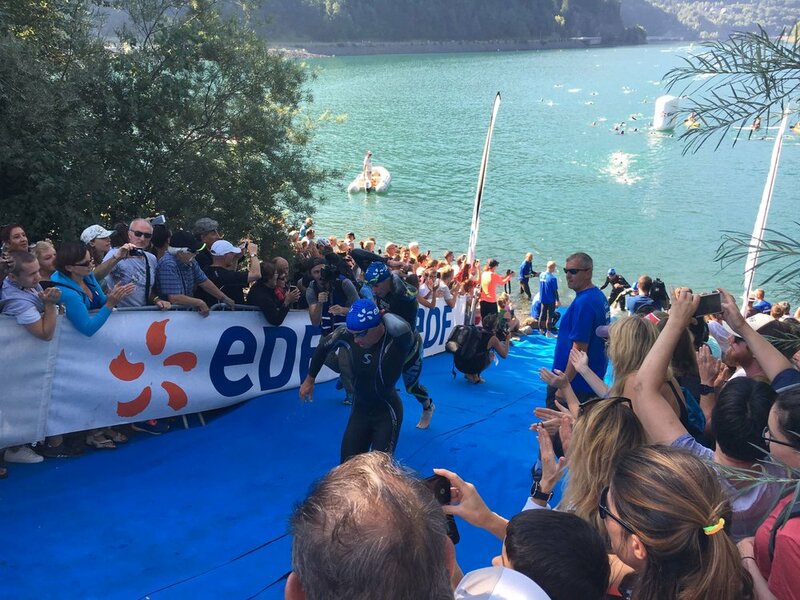 With everything set up in T1 it wasn't long before we donned our wetsuits and after a short briefing we were allowed into the water, a comfortable 18 degrees, and assembled on the start line, watching the digital clock tick towards 09:30. I really enjoyed the first part of the bike leg; a short sharp hill away from the mount line where I kept my intensity down and gradually slid from 1st to 6th place, and then we were into a fast 25km gradual downhill section - I was very glad to be on my TT bike, despite some raised eyebrows from people before the race. While it was non-drafting a 'pack' had formed and I felt I could ride at a maintainable pace and sit at the back of the group in 6th. 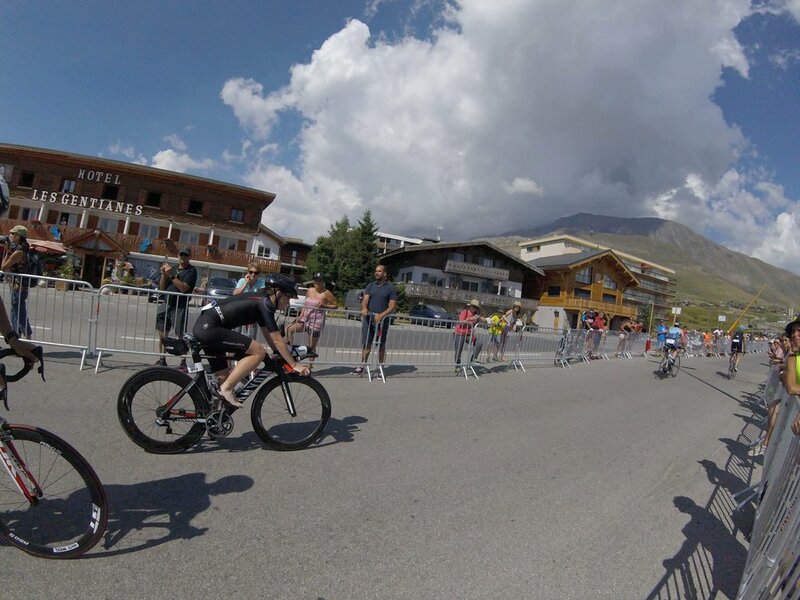 Motorbike referees ensured there were suitable gaps between the riders and soon two athletes had pushed on ahead. The first half hour went quickly as I got into a rhythm and a routine of regularly sipping my liquids and eating an item of nutrition. We then hit the first climb - Col de Grand Serre - winding its way up 1000m over 15km of climbing to a 1378m summit. I settled into my own rhythm which I felt was maintainable and the others disappeared on ahead. I stuck to my plan and consequently had dropped to around 15th position as I crested the hill, took on a water bottle from the aid station and set about descending quickly and smoothly into the hot valley below. After a fast section and making up three places there was a short climb of the 'uncategorized' Col de Malissol, (3.4km at 6%), which was fully exposed to the sun and super hot! 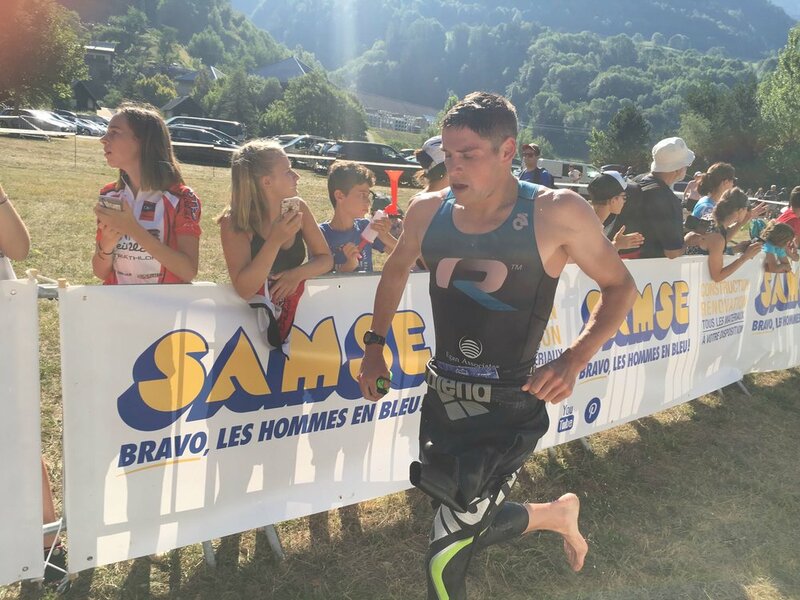 Next, some more really fast sections where I was again thankful to be on my TT bike, and two aid stations at Valbonnais and Le Perier where fresh bottles were welcome and I tipped water over myself to try to keep cool in temperatures now reaching 35 degrees! 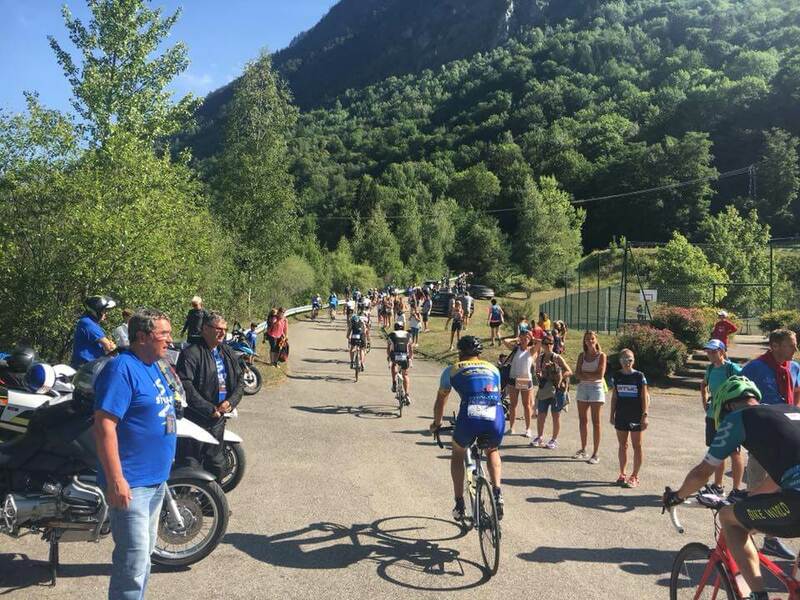 The Col d'Ornon is a 14.4km climb at a relatively shallow 3.9% average grade, but most of the climbing is in the final 4km meaning I was able to hold my rhythm and use the TT bars for much of the earlier part which was only around 2%. I again tried to keep my effort maintainable, and a few more riders slid past, but close to the summit (1373m) I felt a couple of twinges of cramp in my calves - not good! I took on more drinks over the top, continued eating every 25/30 minutes and descended quickly, really getting into a good flow and loving it. Despite a few cramp twinges I regained a couple of places. Next was a short, flat section back into Bourg d'Oisans and then the main climb of the day, an 8.1% average for 13.2km snaking slowly up the infamous 21 switchbacks of Alpe d'Huez. 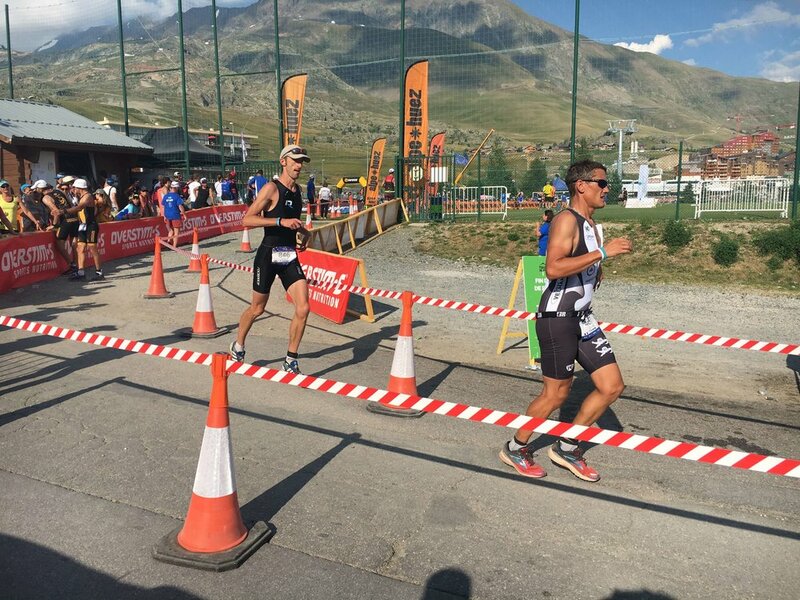 All I could do was manage my body to try and climb without bringing on any further calf cramps, allowing a steady procession of other athletes to pass me, and passing a couple myself. The heat was stifling, especially during the steeper first half, and the whole climb took me 71minutes without really missing a pedal stroke - something, I realised, that's pretty difficult to replicate on any UK road, and certainly not in those temperatures! As I snaked my way up the mountain I did sneak a few glimpses back down at the stunning valley below and mountains in the distance - it was absolutely breathtaking in more ways than one! Nearer the top the heat was slightly less intense, and eventually I made it to T2 and gingerly dismounted. Thankfully there was a slight downhill ramp to access the soft 3G football pitch for T2 and I got my legs going. I racked my bike and whilst taking my helmet and jersey off and putting on socks, shoes, glasses and cap I was getting all sorts of little cramps in strange places from my hip flexors to elbows and even my hands! The frozen bottle of water I'd left with my trainers was still cold so I emptied it over my head I was out onto the run - an undulating three lap course with a couple of km of off-road running in each lap. My legs felt awful, my stomach wasn't feeling great and it was HOT; all I could do was focus on trying to get my cadence going and relaxing into it, hoping my running legs would turn up - it was far from anything I'd experienced before. A couple of km into the lap and on a sharp uphill slope my right hamstring sprang into cramp forcing me to stop and stretch before gently carrying on - I was definitely experiencing some thoughts of wanting to stop, but there was no way I was doing that! In general the first half of the lap was uphill including the trail section with a downhill slope on the road back into town. On the return I felt like I'd started to find a bit of a flow and was moving ok - just keep taking drinks at the three water stations per lap and keep this going... My quads were sore on the downhill but nothing I couldn't handle and I made it back to transition with a lap completed and headed out for the second lap. Things began to deteriorate - progressively more cramps in both hamstrings, and general exhaustion slowed my pace further. A stream of athletes were passing me and while I wasn't feeling negative about that, I was very disappointed and felt let down by my body. I wanted to test my run fitness but my depleted muscles wouldn't allow it! During the final lap I was overtaken by two brits which was a shame as top brit at such an iconic event would've been great. In survival mode I eventually made it round the third lap, almost tripping a few times as my calves sporadically spasmed into cramp. I passed transition for the final time and split off into the finish chute, passing my support for the day, Rodge and Pete. Moving as quickly as my body would allow the slight uphill drag caused a couple more bouts of hamstring cramp, forcing me to stop again, before I finally made it to the finish line and staggered over to the ice baths. I was absolutely done and don't feel I could have done much more on the run. I was disappointed with my run split of 1:57:57, and more so with how my body felt but finishing in 7:02 just over an hour behind the winner, and in 45th position wasn't a bad result for my first race of this kind - almost three hours longer than any race I'd done previously and with very hilly terrain and hot conditions. Battling through that run will definitely give me strength to draw on in future and I'm confident my next race, the Helvellyn Triathlon in September, will feel pretty short in comparison! Well done to all those out there that made it round the course, and maybe one day I'll be back to try and move myself up the rankings! I'd like to extend massive thanks to Mark Egan and Egan Associates for sponsoring me for 2018 which made it possible for me to follow through with the initial plans and go and compete in this incredible environment! I'm also grateful to Solo Sports brands for supporting my swimming with Arena kit, which kept me right at the fore during the swim leg!